Interval Billing Test is used to check the meter’s interval billing results. It is important to do this test synchronized with the meter time. Synchronizing the time is done using the 'Update Time' button in the Status Screen. The interval time stamp is the time of the end of the interval. 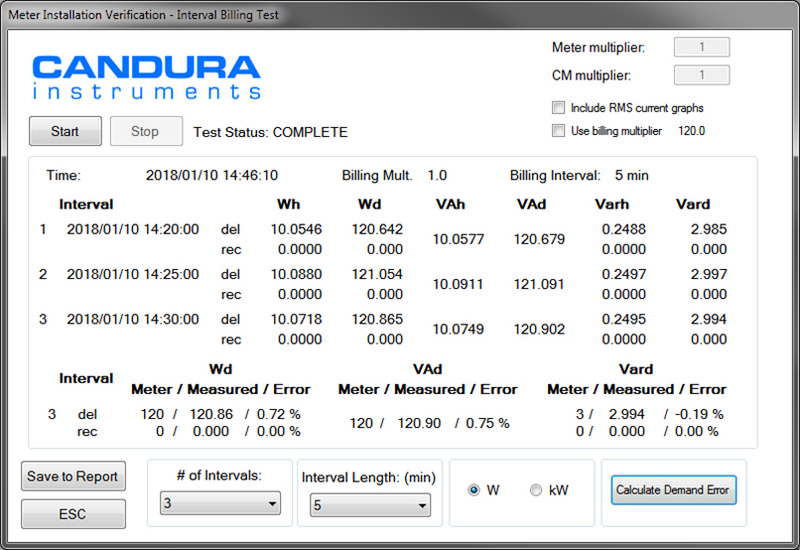 The user can select the number of intervals for the test and the time period for each interval. When the user presses the 'Start' button the software will automatically start the test at the beginning of the next time interval. The software will also automatically stop the test at the end of the last time interval. Both accumulated Watt hours and average Watts (demand) are displayed. The scaling can be adjusted to Watts or kWatts.